After making us wait 14, years during which time various rumors arose, Pixar has finally released Incredibles 2 in cinemas. The studio has cheekily played on the excitement over the sequel in their ads, and in front of the film they play a clip of the actors and director Brad Bird assuring the audience that it was worth the wait… and then immediately play the new Pixar short Bao, making us wait several more minutes. A 14-year gap and such a beloved predecessor have put a lot of pressure on this film; so does it live up to the hype? Incredibles 2 cleverly turns the first movie on its head, pushing Elastigirl into action while her husband stays home with the children. It picks up right where The Incredibles left off, as the family see and follow the Underminer. Initially the family is detained for illegally fighting the supervillain, but Frozone receives an offer he can’t refuse, and is more than happy to let his friends Mr. Incredible and Elastigirl in on it. Winston and Evelyn Deavor, the brother-and-sister team behind an enormous tech company, want to make supers legal again and they need the three biggest superheroes around to make it possible. They decide to start out with Elastigirl based on a cost-benefit analysis run on the three, wounding Bob’s pride. Helen is reluctant to accept the mission because Violet has boy problems and Dash has school problems, but Bob insists that she go and he take care of the family. Sure enough, Helen gets a new nemesis in the form of the Screenslaver, but much like with the first film, all may not be what it seems. The Incredibles has been my favorite movie for years, and Incredibles 2 met my expectations for a follow-up. The animation is absolutely melt-your-eyes gorgeous here, Michael Giacchino returns to provide a lush musical score and the voice acting is perfect. The score seems to have lifted a couple of cues from the 2006 Rise of the Underminer video game, which is really cool. Bob Odenkirk and Catherine Keener join the cast as Winston and Evelyn, and we are introduced to a bushel of new supers in Voyd (Sophia Bush), Krushauer (Phil LaMarr), Reflux (Paul Eiding) and more. Isabella Rossellini plays an ambassador, the first to sign a bill to bring supers back. Rick Dicker’s original voice actor, Bud Luckey, has been replaced with Jonathan Banks, and Dash is re-cast with Huck Milner, as his actor literally grew up in the time since the first film. Banks is a noticeable but forgivable difference, whereas Milner sounds pretty much exactly like Spencer Fox did. Craig T. Nelson, Holly Hunter, Samuel L. Jackson and Brad Bird himself all reprise their roles to wonderful effect; the voice work is all well done and believable. The difference in the animation here is amazing. They’ve really perfected things like hair movement and facial reactions since 2004. When Elastigirl walks in to meet the Deavors, her hair bounces with each step she takes. The facial expressions on Bob and Violet in particular are hilarious and endearing at times, and you can now see that Helen has smile lines. It’s always amazing when they make a direct sequel years later, like this and Toy Story 3, and you can directly compare them to the earlier movies to see how far the technology has come. That being said, I missed the perfect round shape of Helen’s hair in The Incredibles. Here, they give it a more realistic droop, which I don’t care for and think is an unnecessary stylistic variation. Dash also looks a little different, with a (very slightly) rounder head and more visible freckles. I think it’s worth noting that, while I have slight pacing and sound mixing issues with the first film, I don’t here. The technical aspects of Incredibles 2 are nigh perfect. 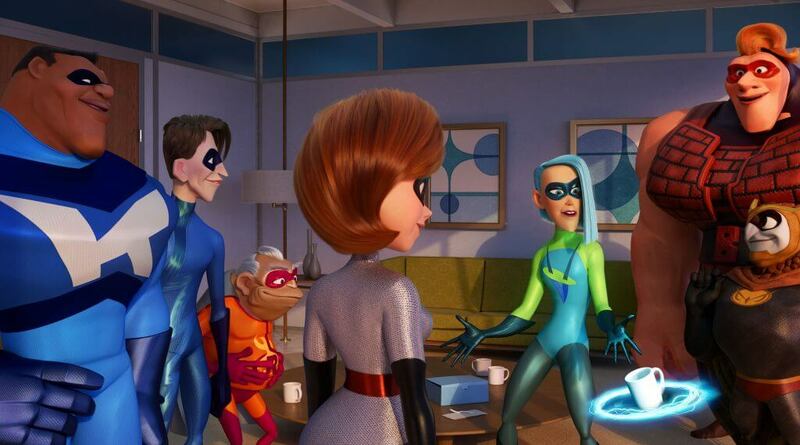 There is something that’s bothering me, though: most people I’ve talked to have been saying this is better than The Incredibles, and in some of the ways I have mentioned, I agree; the technical aspects are pretty much perfect here, whereas I did have various nitpicks with the first movie. Bob’s relationship to his children in Incredibles 2 is just right, and I love scenes like the one where he apologizes to Violet. But in some ways I feel that the first film was more adult. 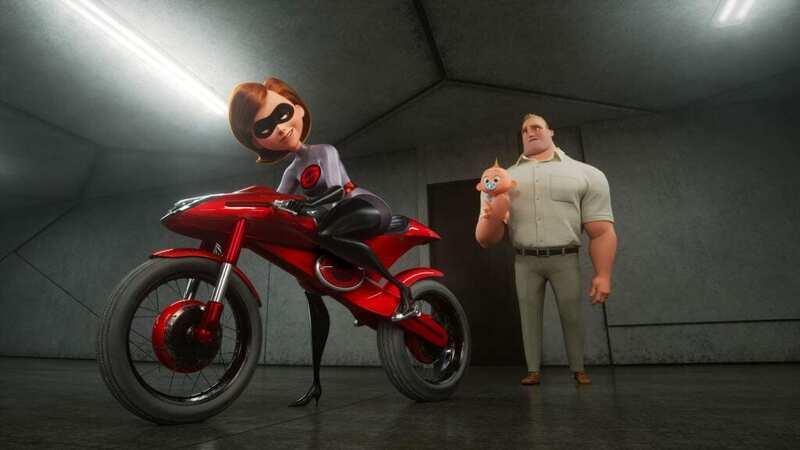 Incredibles 2 has no problem showing mass destruction or even having characters say “damn,” but one thing that always struck me about The Incredibles was how realistically they portrayed Bob and Helen’s marriage. They weren’t a miserable couple who didn’t belong together, but had real problems while still clearly loving each other. Several times in the first movie they even hint at sexual activity or tension, and in that regard Incredibles 2 feels like it has been neutered. Although they say it, it doesn’t feel like these two love one another. They never embrace and the only kiss in the film is when Helen is being mind-controlled and is done to manipulate Bob. It may be a strange complaint, but it really made me uncomfortable after how great and interesting their relationship was in The Incredibles. Granted the two aren’t together for a lot of this film, but that was also true in the first. Bob’s entire arc this time involves putting his family above his own need to get into action, and Helen is focused entirely on her work and worrying about the children. This takes away one of the things that made the original so unique among family films. In fact, I almost wonder if Disney asked Bird and Pixar to dial it down in the sequel. Another thing that strikes me is how pointless the new supers are. They have interesting designs, and I particularly enjoyed Voyd’s enthusiasm and idolization of Elastigirl, but these characters feel completely superfluous; until almost the end they don’t do much of anything. There’s a really nice scene where the Deavors introduce Helen to the new supers, and I thought it was cool for her to see what she’s inspired. I get that Incredibles 2 isn’t about these characters, but it feels like they’re just sort of there, around too much to be background characters but not enough to join the main cast. Incredibles 2 is amazing. I love it, and I feel that, as time goes by, I’ll love it even more. We all wanted this film, and Pixar delivered. Some people were skeptical of it, and that was and is a mystery to me, as Bird is a more than capable filmmaker and Pixar is the studio that made Toy Story 2; this movie was destined to be really good. Technically, it’s better made than the first in a few ways, but I also still have my personal gripes and nitpicks. Nonetheless, I think Incredibles 2 is great and I would recommend it, along with the first one, to everybody. Incredibles 2 is amazing. I love it, and I feel that as time goes by I’ll love it even more. We all wanted this film, and Pixar delivered. Some people were skeptical of it, and that was and is a mystery to me, as Bird is a more than capable filmmaker and Pixar is the studio that made Toy Story 2; this movie was destined to be really good. Technically, it’s better made than the first in a few ways, but I also still have my personal gripes and nitpicks. Nonetheless I think Incredibles 2 is great and I would recommend it, along with the first one, to everybody.